Bogi festival or Bhogi is the first day of Pongal and is celebrated in honor of Lord Indra, "the God of Clouds and Rains". Lord Indra is worshiped for the abundance of harvest, thereby bringing plenty and prosperity to the land. Thus, this day is also known as Indran. On Bhogi all people clean out their homes from top to bottom and collect all unwanted goods. This day is meant for domestic activities and of being together with the family members. All the houses from the richest to the humblest are thoroughly scrubbed and whitewashed. Homes are cleaned and decorated with "Kolam" - floor designs drawn in the white paste of newly harvested rice with outlines of red mud. Often pumpkin flowers are set into cow-dung balls and placed among the patterns. Fresh harvest of rice, turmeric, and sugarcane is brought in from the field as preparation for the following day. A special puja is performed on the first day of Pongal before the cutting of paddy. Farmers worship the sun and the earth by anointing their ploughs and sickles with sandalwood paste. It is with these consecrated tools that the newly-harvested rice is cut. 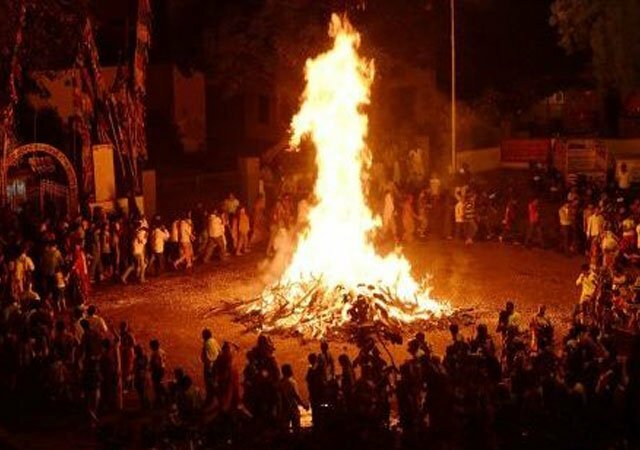 Another ritual observed on this day is Bhogi Mantalu, when useless household articles are thrown into a fire made of wood and cow-dung cakes. Girls dance around the bonfire, singing songs in praise of the gods, the spring and the harvest. The significance of the bonfire, in which is burnt the agricultural wastes and firewood is to keep warm during the last lap of winter. In Andhra Pradesh, this day is celebrated by girls burning their old clothes and wearing the new ones after an oil massage and bath. Then follows Pongal Panai, a ritual in which new earthenware pots are painted and decorated with turmeric, flowers and mango leaves.